St Stephen’s Green is a popular public park just south of the heart of Dublin. 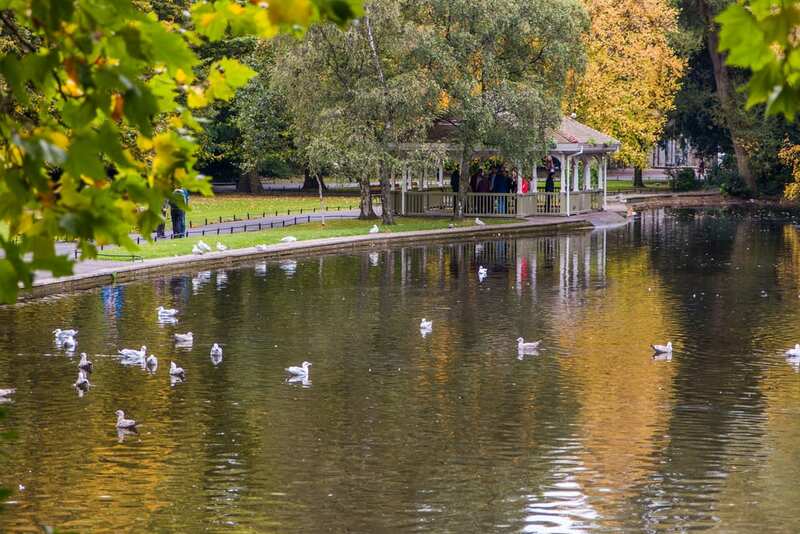 It is one of the largest parks in the city and has a number of fantastic attractions in the nearby vicinity which are worth exploring if you have booked accommodation close to St Stephen’s Green. Known as ‘Ireland’s World Famous Shopping Street’, Grafton Street is just a short walk from St Stephen’s Green and is home to a variety of retail stores, cafes, bars, restaurants and hotels. Many of these stores are housed within beautiful historic buildings which also add to the charm of the street and there are some iconic Irish businesses to be found here as well including the likes of Brown Thomas, Bewley’s Grafton Street Café and Weir & Sons. The Little Museum of Dublin has often topped charts for the ‘best museum’ in the city and whether you are staying nearby or in one of the boutique hotels in Dublin City Centre it is worth a trip out to visit this fascinating museum. The Little Museum opened in 2011 and was created to tell the story of this fascinating Irish city. It is home to more than 5,000 artefacts which each help to educate visitors on Dublin’s rich past. Visits to the museum are by tour only and to avoid disappointment, the Little Museum advises that you book tickets in advance as tours quickly become full. The park itself is, of course a main attraction in the area. If you are booked into Stephen’s Green Hotel Dublin then you will have this historic park on your doorstep. The park features a playground, a garden for the visually impaired, a variety of plants and different species of birds, and is home to a number of sculptures and monuments which are key to Irish history. It is possible to take a tour of the park; these are hosted by the nearby Little Museum of Dublin and take place on weekends. Just around the corner from St Stephen’s Green is the National Concert Hall, one of the city’s main live music venues which plays host to more than 1,000 different events each year. Whether you have an interest in classical music, opera, or contemporary performances, it is worth seeing what is happening at the National Concert Hall when you are in Dublin. The Concert Hall is also home to the RTÉ National Symphony Orchestra, Chamber Choir Ireland, Irish Baroque Orchestra, Music Network and Music Generation. If you enjoy adrenaline-fuelled attractions then you will love Escape Dublin. This live escape game challenges you to complete logic tasks, solve puzzles and try to escape from one of the two themed rooms here within the time limit set. There is Espionage which is set in what appears to be an ordinary apartment but is anything but and the Da Vinci Room.